I simply use baking soda mixed with a little water to make a paste . I brush my teeth, gums and tongue to whiten and clean teeth and kill bacteria and gingivitis . This also raises the pH in your mouth to keep bacteria out. I use white vinegar or peroxide to kill germs on my toothbrush. 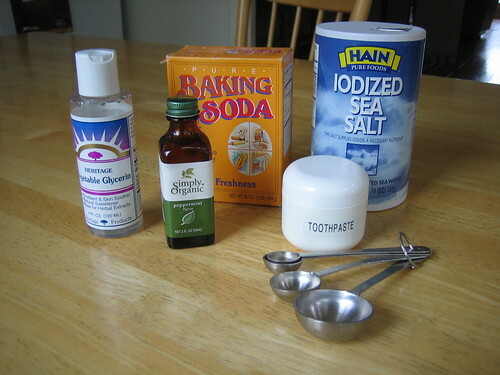 Skip the harmful chemicals in many commercial toothpastes and make your own. This is a simple, inexpensive, odor-eliminating, tooth-whitening, and very effective formula from Organic Body Care Recipes (Storey, 2007) By Stephanie Tourles.